As summer comes to a close, the folks at bIXI Montréal have come up with a great new subscription membership plan for the occasional user. A bIXI key is issued with an online registration for $5 CDN ($5 US). Each day (24 hours) in which the key is used the subscriber is charged $5 and gets an initial ride time of 45 minutes with no extra charge for each use. This is a $2 savings over the regular day access rate which only gives a 30-minute initial ride time for each use during the 24 hours. The best part is that having the bIXI key eliminates using your credit card kiosk each time a bike is taken. Why has this taken so long to implement!!! When London first started, this was the only way a casual user could sign up for a day pass. This is a great plan for frequent visitors to the city who just can't utilize the value of monthly or yearly subscriptions. What about Toronto, Ottawa-Gatineau, London again, Minneapolis-St.Paul, Chattanooga, the Boston region, and the Washington, DC region? When do they get this plan? As new bike-sharing systems begin or older ones expand, the question of where to put bike-sharing stations needs to be answered. There are formulas that weigh proximity to transportation hubs, shopping areas, and residential density that are used for indicators. Following the in-place bicycling infrastructure as a guide is also used. Since the prospective users are the ones to be served, the best resource for bike-sharing station location is the users! The users know here they need stations at the start and the end of their journeys. 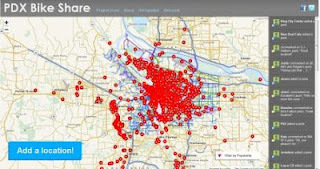 Theses crowdsourcing maps are the answer to the question. 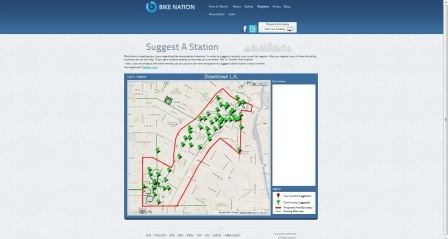 They ask the users where stations should be placed. Developed originally for Capital Bikeshare in the Washington, D.C. region, their popularity for bike-sharing has grown quickly as shown above. Bike Nation will soon be fully operational in Anaheim. They recently won approval from the Long Beach, California, City Council to build a 2,500-bicycle/250-station service to go along with the installations planned in the Los Angeles basin areas of Downtown L.A., Venice, Hollywood, and Westwood. Greenville, South Carolina has issued a bike-share RFP. The hot summer has made the Southeast USA a hot bed for bike-sharing. After an exhausting ride with just one minute to spare before those extra charges begin, it's great to know that you can dock your bike-share and get a refreshing drink or a quick snack. Well, the Hangzhou Public Bike Service thinks its users want that. 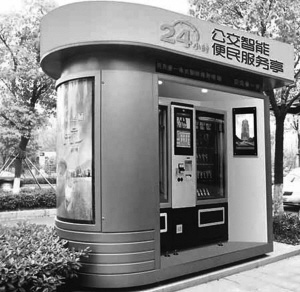 They have commissioned 200 food and beverage kiosks to be installed next to some of the 2260 bike-share stations throughout Hangzhou according to a recent report. Also out of Hangzhou there have been a few reports of bicycle failures due to rust. According to China Gxnews, a woman was thrown from a bike-share when the front fork collapsed. The report said the metal of the fork was so rusted that it was "paper thin". The oldest of the bikes have been in service for three years. Many are now being replaced. 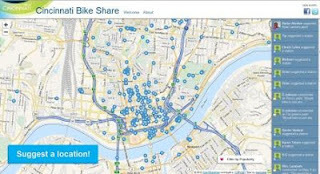 The Bike-sharing World Map is the #1 resource for bike-sharing systems. It shows new systems which come online which might not be covered in The Bike-sharing Blog. Keep up with the changing bike-sharing world by frequent visits to The Bike-sharing World Map. Posted by Russell Meddin at 9:13 PM Labels: Bike Nation, Bike Share Philadelphia, Bixi, Capital Bikeshare, Cincinnati, Citi bike, Hangzhou, Hangzhou Public Bicycle Service, Los Angeles, Montreal, NYC, PDX Bike Share, Philadelphia, Portland, Washington D.C.